The 160-Watt 2.1 channel home theater surround sound system Turcom TS-404 offers good mix of features and specifications. The model comes with two 40W surround sound Bluetooth soundbars and 80W wireless subwoofer. The specifications of this model is very promising at affordable price tag. In aesthetic part, we haven’t seen such attractive design for some time. As we don’t recommend soundbars and speaker systems solely base on specification and looks, we tested and investigated this models worth. Here’s our Turcom TS-404 review to help you decide whether this model is worth a buy. 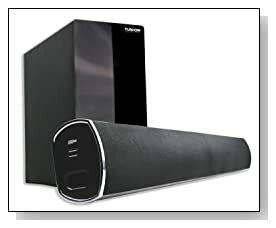 The 2.1 channel home theatre sound system comes with two 40W surround sound wireless sound bars measuring 4”x4”x36” long. The soundbars has total impedance of 8 Ohm, frequency response of 85Hz~20KHz and > 73 dB S/N ratio. The wireless subwoofer has 3 Ohm impedance and frequency response of 20Hz~85Hz. The sound output quality from this system was nothing short than WOW. We played number of music files from different genre and were enjoyed the time with this model. The Class D amplified sound output from the speakers were clear crisp at higher volumes. The bass was powerful enough for the medium sized home theater setup. Speaking of useful features, the Turcom TS-404 has greater connectivity features. What makes this speaker system brilliant is its Bluetooth connectivity, no more messing up with wires. You can easily connect and play music from your smartphones, tablets, laptops, AV systems or any other Bluetooth enabled gadgets. The model also supports USB input and two audio RCA stereo input to connect with TV. However it’s not just the sound quality that makes this model special. The plastic used in this speaker system is not cheap and has superior smooth finish the feels good to touch. The steel seam at ends of the speaker-bars are not very glittery but adds elegance to the unit. From a distance, the unit looks nothing less than a premium brand speaker system. These speakers can be wall mounted, some users might find this feature useful. Overall, this 160W 2.1 channel home theater speaker system redefines the term ‘value for money’ and is certainly a best surround sound speakers you can buy at this price tag. It’s a combination of superior sound quality, useful features and good build quality that places Turcom TS-404 right next to other premium models. This model was not just a performance powerhouse but also has excellent looks. 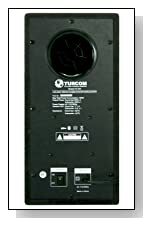 With all these things considered, it’s not hard to describe the Turcom TS-404 is one of the best choices to consider.